Using NASA’s Wide-field Infrared Survey Explorer (WISE), astronomers discovered a distant galaxy cluster, MOO J2342.0+1301, which is located 7.7 billion light-years away and is hundreds of times more massive than our Milky Way. Our solar system, with its colorful collection of planets, asteroids and comets, is a fleck in the grander cosmos. Hundreds of billions of solar systems are thought to reside in our Milky Way galaxy, which is itself just a drop in a sea of galaxies. The rarest and largest of galaxy groupings, called galaxy clusters, can be the hardest to find. That’s where NASA’s Wide-field Infrared Survey Explorer (WISE) can help. 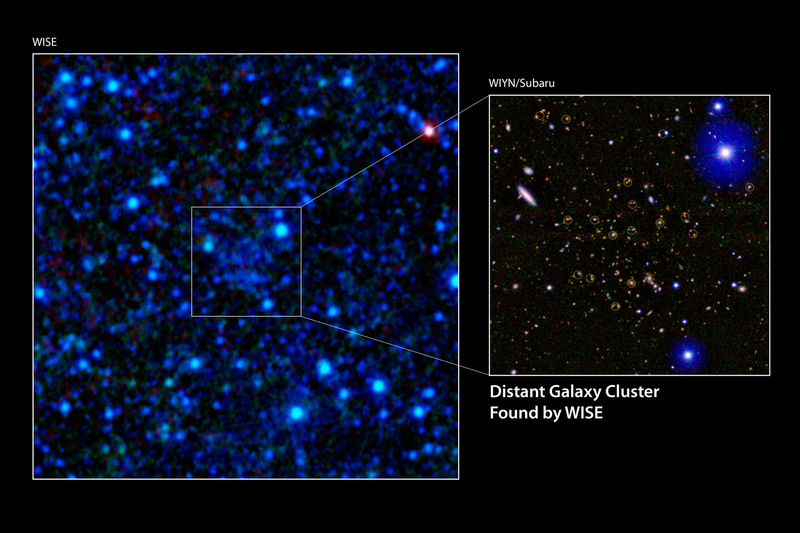 The mission’s all-sky infrared maps have revealed one distant galaxy cluster and are expected to uncover thousands more. These massive structures are collections of up to thousands of galaxies bound together by gravity. They were born out of seeds of matter formed in the very early universe, and grew rapidly by a process called inflation. “One of the key questions in cosmology is how did the first bumps and wiggles in the distribution of matter in our universe rapidly evolve into the massive structures of galaxies we see today,” said Anthony Gonzalez of University of Florida, Gainesville, who led the research program. The results are published in the Astrophysical Journal. WISE completed its all-sky survey in 2011, after surveying the entire sky twice at infrared wavelengths. The 16-inch (40-centimeter) telescope ran out of its coolant as expected in 2010, but went on to complete the second sky scan using two of its four infrared channels, which still functioned without coolant. At that time, the goal of the mission extension was to hunt for more near-Earth asteroids via a project called NEOWISE. NASA has since funded the WISE team to combine all that data, allowing astronomers to study everything from nearby stars to distant galaxies. These next-generation all-sky images, part of a new project called “AllWISE,” will be significantly more sensitive than those previously released, and will be publicly available in late 2013. Gonzalez and his team plan to use the enhanced WISE data to hunt for more massive galaxy clusters. The first one they spotted, MOO J2342.0+1301, is located more than 7 billion light-years away, or halfway back to the time of the Big Bang. It is hundreds of times more massive than our Milky Way. By scanning the whole sky with the improved AllWISE data, the team will sleuth out the true monsters of the bunch, clusters as big as thousands of times the mass of the Milky Way, assembled even earlier in the history of the universe. Galaxy clusters from the first half of the universe are hard to find because they are so far away and because not very many had time to assemble by then. What’s more, they are especially hard to see using visible-light telescopes: light that left these faraway structures in visible wavelengths has been stretched into longer, infrared wavelengths due to the expansion of space. WISE can hunt some of these rare colossal structures down because it scanned the whole sky in infrared light. Other projects planned for the enhanced WISE data include the search for nearby, hidden cool stars, including those with masses as low as planets. If a large planet or tiny star does exist close to our solar system, an object some call “Tyche,” then WISE’s infrared data may reveal it. Other authors of the new study are: Daniel Gettings and Conor Mancone of the University of Florida; Adam Stanford of Lawrence Livermore National Laboratory, Livermore, Calif., and University of California, Davis; Mark Brodwin of University of Missouri, Kansas City; Daniel Stern of JPL; Gregory Zeimann of University of California, Davis; Frank Masci of the Infrared Processing and Analysis Center at the California Institute of Technology, Pasadena; Casey Papovich of Texas A&M University, College Station; Ichi Tanaka of the National Astronomical Observatory of Japan; and Edward (Ned) Wright of UCLA. JPL manages, and operated, WISE for NASA’s Science Mission Directorate. Edward Wright is the principal investigator and is at UCLA. The mission was selected competitively under NASA’s Explorers Program managed by the agency’s Goddard Space Flight Center in Greenbelt, Md. The science instrument was built by the Space Dynamics Laboratory in Logan, Utah. The spacecraft was built by Ball Aerospace & Technologies Corp. in Boulder, Colo. Science operations and data processing take place at the Infrared Processing and Analysis Center at the California Institute of Technology in Pasadena. Caltech manages JPL for NASA. More information is online at http://www.nasa.gov/wise, http://wise.astro.ucla.edu and http://jpl.nasa.gov/wise . 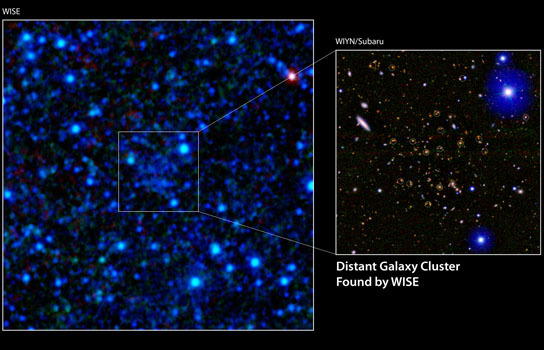 2 Comments on "WISE Spots Massive Distant Galaxy Cluster"
Highly populous galactic clusters at just a 7.7 billion light years away by NASA’s WISE (Wide field infra-red survey explorer) shows enormous aggregation of galaxies in the near past of the sun which is 4.6 billion years old only. Generation of galaxies were complete and numerous then, compared with the distant past, which were further dragged away by expansion of universe. Galactic evolution had entered a mature stage then. Thank You. on the Milky Way collection, and the trailing Andromeda collection. Curious how the Norma Cluster (w/Abell #___), herds galactic clusters in one direction. This one may be another example- The pull, or tug, might be an elliptical effect, such as an orbit. Perhaps this is how Andromeda seems to be gaining on the Milky Way from the “rear” in our trip towards the Norma Cluster? Aloha.